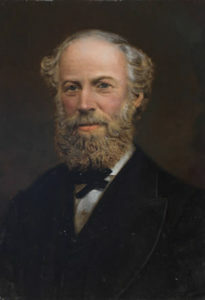 Frederick Thompson Mott was born in Loughborough and studied as a boarder at the Proprietary School (now the Museum) in Leicester. He ran a prosperous family wine business in Galltree (Gallowtree) Gate, Leicester, that boasted supplying Ridgway’s tea and Wachter’s champagnes ‘to all the Queen’s palaces’. He was a Borough Councillor, serving on the Museum, Free Library and Water committees, and was the Lit and Phil President for 1874-75 and 1890-91, and a long-serving Vice President. Mott’s greatest passion since childhood had been the countryside, and during his youth he frequently roamed Charnwood Forest studying natural history. His first book Flora Odorata (1843) catalogued sweet-scented flowers in British Gardens and his later Guide to Charnwood Forest (1868) is a true reflection of his love of nature. He was fascinated by every branch of science and the universe, and his published works included papers on geology, medicine, art and philosophy. In May 1869 The Club congratulated Frederick Mott on being elected a Fellow of the Royal Geographical Society. A Liberal and free-thinker, Mott was the acknowledged rebel of The Club. Described alternatively as ‘pugnacious’, ‘quixotic’, a ‘firebrand’, ‘argumentative’, ‘eccentric’ and an ‘arch-heretic’, he delighted in stirring up fiery arguments at every turn. Controversially for that time, he wore a beard and even published a paper in 1855 defending beards. Country-loving Frederick led The Club’s summer excursions by horse-drawn wagonette to Charnwood Forest and to his place at Benscliff. Here members would stroll in the nearby woods or scale the rocky crags, sometimes picking wild raspberries or on one occasion attempting water divining. They would then partake of tea in a specially erected tent on Mott’s lawn, where some enjoyed a game of quoits. In 1876 Mott put up a new country cottage at Birstall Hill, ‘built for his uneasy soul that finds no peace in cities’, and this became another happy destination for Club summer excursions. Source: Caroline Wessel, 2010. The Club. pp.85-96 in Exchanging Ideas Dispassionately and without Animosity (Leicester). See also F.T. Mott , 1893. The Proprietary School. Leicestershire and Rutland Notes and Queries, vol. 5 No. 396. pp. 290 – 293; Jenkins, J., 2005. A wine merchant, botanist and poet. The Leicestershire Historian No. 41, p.8.